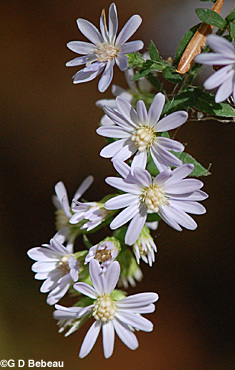 Heart-leaved Aster is an erect native perennial; stems may be from 1 to 4 feet high. Branching can occur, particularly in the inflorescence. Stems are green, becoming reddish with age, usually smooth near the base and can have fine hair near the top. Leaves of the lower stem are stalked, have sharp coarse teeth and heart-shaped bases from which comes the common name. Stalks may have a narrow wing. Upper leaves are smaller with more ovate bases and resemble those of Arrow-leaf Aster, S. urophyllum. The floral array is taller than wide - more of a pyramidal shape with long arching or ascending branches. In the flower panicle there will be leaf-like bracts and smaller more scale like bracts. Flowers have two types of florets - ray and disc. The ray florets can be white or pale blue as shown here, - in sun they are usually blue. These usually number 10 to 16 and are pistillate (fertile). The ray florets surround 10 to 15 pale yellow, tubular, disc florets which, like most asters of this genus, turn reddish at maturity. These are bisexual and fertile. The floret throat has five triangular lobes which open erect to slightly spreading. The anthers of the 5 stamens surround and are appressed to the style. The heads are 1/2 - 3/4 inch wide. Each head has a short stalk (a peduncle). Above the leafy bracts on the flower stalks and surrounding the head, are 4 to 6 series of phyllaries that are unequal in size, linear to oblong is shape, whitish on the margins with a central green stripe that ends in a somewhat diamond shape. Seeds are a dry 4 to 5 nerved cypsela, 2 to 2.5 mm long, with tufts of white or rosy tinged pappus for wind dispersal. Seeds require 60 days of cold stratification for germination. Habitat: The root system has rhizomes with many fibrous roots. Plants either form clumps or small colonies. The plant prefers light shade with partial sun, moderate moisture, rich soils, such as found in open woods or wood edges. 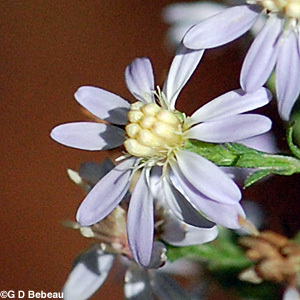 Names: The former scientific name for this species was Aster cordifolius. 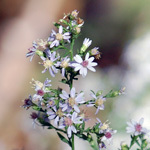 All the new world asters, formerly in the genus Aster, have now been reclassified, most into the genus Symphyotrichum. The genus name is from the Greek symphysis, for 'junction', and 'trichos', for hair, all of which relates to a fine division by botanists of certain plant characteristics. 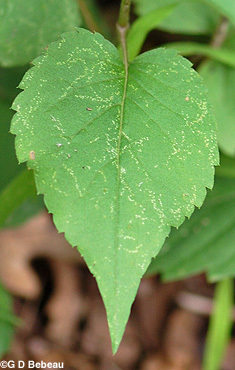 The species name cordifolium means 'with heart-shaped leaves'. The author name for the plant classification - ‘G. L. Nesom’ is for Guy L. Nesom (b. 1945) American botanist who has published papers on the nomenclature of asters. His work amended that of the original classifier - '(L.)' which refers to Carl Linnaeus (1707-1778), Swedish botanist and the developer of the binomial nomenclature of modern taxonomy. Comparisons: The most likely species in our area to confuse with this one in overall appearance and especially in the shape of the lower leaves are the White Wood Aster, E. divaricata, or the Bigleaf Aster, Eurybia macrophylla. Differences are that E. macrophylla has white petals with little or no lilac color, and the flowers are in a flat-topped cluster. E. divaricata also has flat-topped clusters and has a group of basal leaves in addition to stem leaves. The ray petals of both Eurybia species also look different. Above: 1st photo - The floral array may be small and unbranched or wide and branched. 2nd photo - The ray florets surround a central disc of light yellow tubular disc florets which mature to a dry cypsela. 3rd photo - The lower leaves have heart shape bases, can have a narrow wing as shown here, and coarse sharp teeth. Below 2nd photo - Phyllaries of the flower head have dark green diamond shape tips. Below them on the flower head stem are a series of longer leafy bracts. Below: 1st photo - The large leaves of the lower and middle stem have heart-shaped bases and stalks with wings, while the leaves just below the floral array (2nd photo) have ovate bases and are almost stalkless. Within the array they become stalkless bracts. Notes: Eloise Butler first reported planting Heart-leaved Aster on Sept. 22, 1912 with plants obtained in Wahoo Glen, Minnehaha Park, Minneapolis and again in 1913 from the same source. Twelve came on Oct. 15, 1914 from the Fort Snelling, Minneapolis area and another 12 on Oct. 19, 1914 from Mendota. Multiple planting occurred in many years such as 1918, '19 and '20. Eloise always used the former name of Aster cordifolius. Martha Crone planted it in 1945 and listed the plant on her 1951 Garden Census and it has been on all subsequent census lists. Both Eloise Butler and Martha Crone frequently recorded A. lowrieanus as a separate species (Lowrie's Aster). Eloise recorded planting that species in 1919 and Martha Crone in 1937, '38, '45 and '48, This species name is no longer recognized as distinct (see details in Flora of North America, Ref. #W7) and is considered a synonym for S. cordifolium which is found throughout the eastern half of North America. In Minnesota it is known in only 1/3 of the counties, most in the eastern half of the state, including most of the metro counties. Asters are difficult to study. Where-ever Butler or Crone listed A. lowrieanus, I have included it here as S. cordifolium. 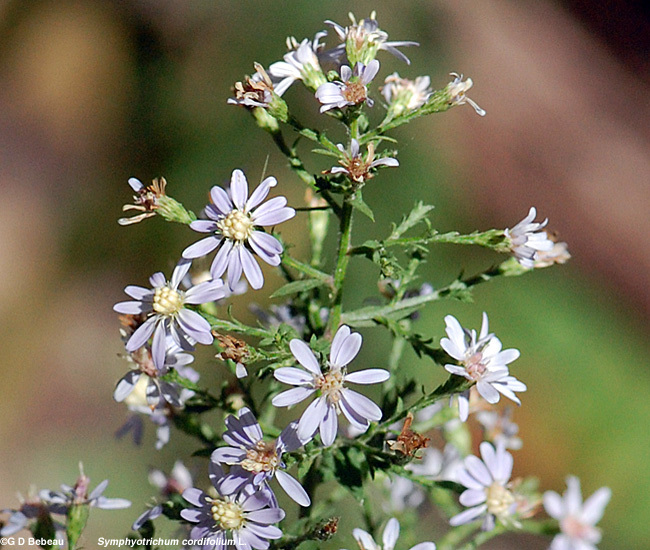 There are twenty-four species just of Symphyotrichum listed by the DNR and the U of M as being found in Minnesota, some with several subspecies. Eloise Butler in her 1915 report to the Board of Park Commissioners wrote about the asters in the Garden and of this species she wrote: "Aster cordifolius is abundant in the woods along our river banks. I have specimens of remarkable beauty where I have planted it in burnt-over tracts, branching diffusely and crowded with pale blue flowers whose disks take on a richer tone in maturity." Much the same text was incorporated into an essay that was sent to The Gray Memorial Botanical Chapter, (Division D) of the Agassiz Association for publication in the Asa Gray Bulletin. Text here.